The opening instrumental The Coming of Winter is a soul tearing melodic lament, building up into the crushing weight of riffs and rising double bass. If you prefer to stay on the North American continent for analogies, The Coming of Winter generates expectations similar to Novembers Doom and Daylight Dies, but Forlorn Path actually has a slightly different beast lurking underneath their melodic doom. Empire of Decadence following The Coming of Winter reveals the unexpected blastbeats and blackened intensity riding atop the riffs wall of sound, all of it with an incredible melodic feel. 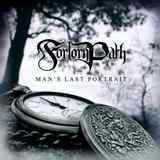 Forlorn Path combines brooding gloominess with rebellious spirit, which just won’t sit still. Rousing atmospheric melodies atop the booming double bass are to die for in Words Only Winds Can Speak, but then the hooks this song brings simply rip your soul apart with pointed penetrating depth. Piano interludes pop out of nowhere bringing brief respite, succumbing to monster dejected chugs and out of nowhere blasts (Empire of Decadence, Words Only Winds Can Speak). Barbaric and dissonant at first, Relics unfolds into the monumental conclusion, no less barbaric, but soothing nevertheless. Guitars of Forlorn Path never settle, switching from steady aggressive push to a quick moment of sheer tenderness on a moment’s notice (Masquerade). The vocals, courtesy of Dave Imbriaco, are also not typical bottom dwelling deathdoom growls. Instead, his voice travels up and down, and while reaching a few low points, mostly it spills out the guts at the higher pitch, going alongside lively vibrating guitars, as in the chorus of Ghosts, another song highlight among many on the album. The overall mood of the album is grim, whether it is piano playing or pummeling double bass or devastating shriek or sad closing melody (case in point combining all of these is As Hope Fades). The sense of loss and demoralizing distress runs so deep through the Man’s Last Portrait’s title track that when listening to it one can reach that cathartic state when real problems subside just momentarily and you begin to sympathize more with the imaginary hurts described by the music … so that slowly your own miseries begin to heal. Words, as if seared out of Dave Imbriaco’s essence complete the deal. Very rarely Forlorn Path become a little mechanical, and their pure deathy moments (What Lies Beyond) regain fluidity in large part due to the “solar” guitar flights of its members. In one of the recent reviews on this site my colleague Jared mused that Aphotic by Novembers Doom is something he couldn’t fathom to be American since it sounds so profound. I guess the subliminal message was that only in Europe they can make the music so deep, and shallow Americans are incapable of the feat. Despite the fact that a pair of Forlorn Path guitarists, Ivan Chernikov and Yuriy Garnaev, has Russian origins to their names, their band will make my friend Jared add another band to the “profound” list. Forlorn Path is another American band which is on par with Novembers Doom and Daylight Dies, and would hold their own next to the likes of Swallow the Sun, Yearning and Draconian. And while European doomdeath may appear a little formulaic (yet I love the formula), Forlorn Path, with their blackened edge, provides the unexpected direction and more innovation in the genre than some Europeans.